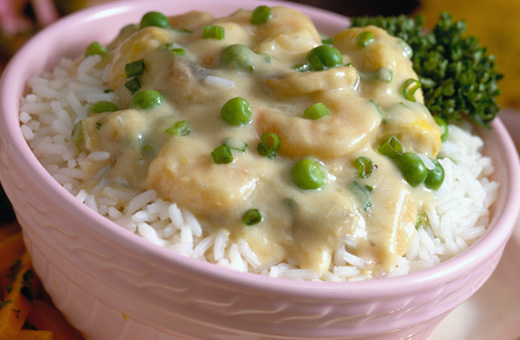 Mushrooms, onions, artichokes and peas ... simmered with shrimp in Alfredo sauce. Serve over hot cooked rice. While rice is cooking, heat olive oil in a large non-stick skillet; add mushrooms, onions and sauté until tender. Add artichokes, Alfredo sauce, shrimp, peas, and blue cheese and continue to simmer for 10 minutes. Divide rice equally into four bowls. Spoon shrimp and artichoke mixture over rice. Sprinkle with fresh ground pepper, if desired. Recipe Tip: Do you have a rice cooker? To prepare the rice for this dish … Add white rice and water to the inner pot of your Aroma® Rice Cooker. Press the Cook Switch or set to White Rice. When the rice cooker beeps, proceed with remainder of recipe as directed above.